As you may have noticed, the blog is undergoing an expansion of sorts. I’ve added a number of tabs menu of fun pages at the top to be expanded upon as time allows. Check out the recipes, eating seasonally 101, inspiration, and the book tabs; I have added some content to those already. I made ratatouille this week; the recipe is the one used to create the animated version Remy cooked in the Pixar film Ratatouille. It is so absolutely delicious, it’s worth the time needed to create it. Almost all of the vegetables for the recipe are in season here right now, and I’m sure that’s one of the reasons it was so scrumptious. I say “was”, because it has disappeared from the house already, scarfed down by Husband and The Boy. Do yourself and your family a favor, and take the time to make this dish. 1. Heat oven to 450 deg. Place pepper halves on a foil-lined baking sheet, cut side down. Roast until skin loosens, about 15 min. Remove from heat and let rest until cool enough to handle. Peel and chop finely. 2. Combine oil, garlic, and onion in medium skillet over low heat until very soft but not browned, about 8 min. Add tomatoes, their juices, thyme, parsley, and bay leaf. Simmer over low heat until very soft and very little liquid remains, about 10 min., do not brown; add peppers and simmer to soften them. Season to taste with salt, and discard herbs. Reserve 1 T of liquid from mixture, and spread remainder of sauce in bottom of an 8-inch skillet that can be put under the broiler. 1. Combine reserved piperade, oil, vinegar, herbs, and salt and pepper to taste in a bowl. Heat broiler and place byaldi underneath until lightly browned. (I never do this. It’s still delicious. Just sayin’.) Slice in quarters and very carefully lift onto plate with offset spatula. Drizzle vinaigrette around plate. Serve hot. Now that you’ve dutifully read the whole recipe, you’d like to be rewarded with pictures of the finished plated product, wouldn’t you? Well, slacker that I am, I didn’t photograph the finshed plated product, mostly because I was hungry. I will make it again, and I will photograph the end result next time. Promise. 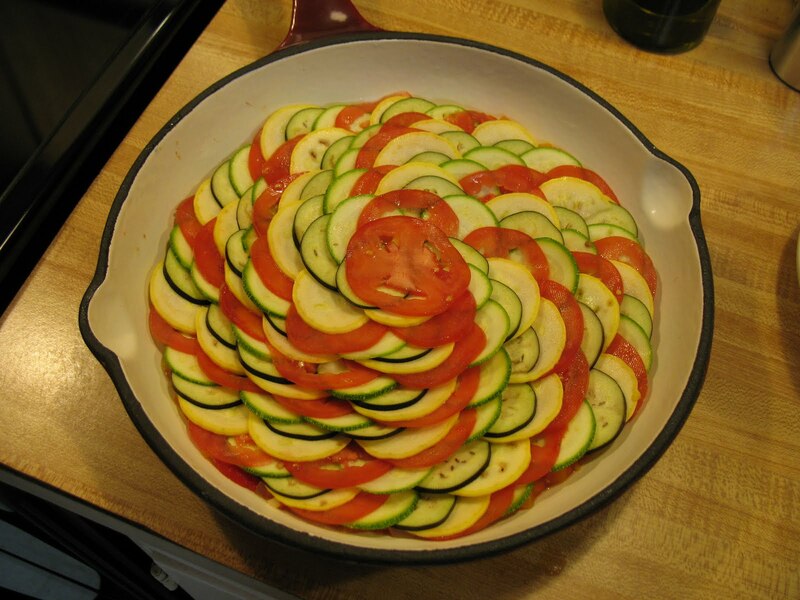 If you Google “Confit Byaldi”, believe me, you will get all kinds of looks at this dish. In addition, I have blogged about this dish before. Search my archives for “Anyone Can Cook”. And before you make it, rent “Ratatouille” and watch Remy make it, and watch Anton eat it. It’s a soulful, comforting dish. Make it and serve it with love. Previous: Previous post: Got Salad Dressing? Great recipe, Marti! I tried it and it was delicious!